Passing the Dream Act, and placing all of the potentially immediately eligible workers on a path to legal status, would add a total of $22.7 billion annually to the U.S. gross domestic product (GDP). Because the gains from legalization grow each year, the cumulative increase in GDP over 10 years would be $281 billion. If even half of all workers who are immediately eligible for the Dream Act complete the educational requirements to move from conditional status to lawful permanent residency—as distinct from the military service or employment paths—the annual gains could be even higher, creating what we term an “education bump” and reaching as high as $728.4 billion cumulatively over a decade. Over a decade, this means the GDP gains from the Dream Act could be as high as a cumulative $400 billion. With the education bump, the gains could be as high as a cumulative $1 trillion. On a per capita basis, passing the Dream Act would ultimately raise the average incomes of all Americans by between approximately $82 and $273, annually. Overall, the data from this study are clear: Passing the Dream Act would significantly improve the American economy. Scenario 1 is based solely on individuals in the workforce who meet the age at time of entry and length of residency requirements. Scenario 2 is based on individuals in the workforce who meet the age at time of entry and length of residency requirements and who also already meet the educational requirement for conditional status. We include both scenarios for two reasons. First, we believe that passage of the Dream Act would be a big catalyst for people who currently do not meet the educational requirements for conditional status to complete either a high school diploma or a GED, thus making more people eligible.12 Second, including both scenarios illustrates that the less onerous the path to conditional legal status under the legislation, the greater the economic benefits to the nation as a whole. Using data from the 2014 American Community Survey (ACS) provided by the Center for Migration Studies (CMS),14 this analysis looks at the subset of individuals who would potentially be immediately eligible to apply for the Dream Act and who are currently employed—which is key for the type of economic analysis conducted here. 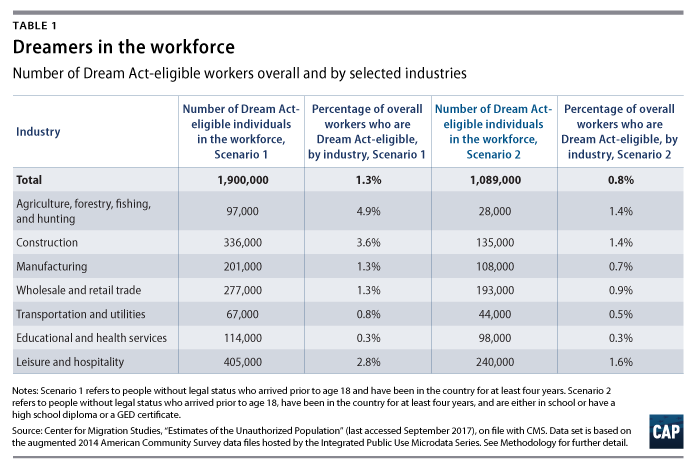 As Table 1 illustrates, there are 1.9 million young people in the workforce who would be immediately eligible for the Dream Act based on their age at time of entry and length of residency requirements (Scenario 1) and nearly 1.1 million young people who meet the age at time of entry, length of residency, and educational requirements (Scenario 2). So what would happen if Congress were to pass the Dream Act and the immediately eligible population in the workforce were able to get legal status and eventual citizenship? To estimate the potential economic gains, the authors of this brief, building on the work of economist George Borjas and economists Gianmarco Ottaviano and Giovanni Peri,18 simulate the effects of legalization using a general equilibrium model of the economy that is calibrated using detailed information on wages, employment, and industry value added. See methodology below for more on this model. The long run: Over time, employers respond to the increased labor productivity of their newly documented workers by increasing investment in capital—in things such as tools, machinery, and supplies—which amplifies the gains from legalization. Education bump: Finally, even more economic gains arise as those who receive conditional status under the Dream Act obtain lawful permanent residence by completing the educational requirements. While higher education is only one of the three pathways to LPR status under the Dream Act, it is an important one. This analysis assumes that half of those eligible for the Dream Act obtain LPR status through the educational pathway. In doing so, these individuals will become more-highly skilled workers with higher productivity, which increases their contributions to the U.S. GDP. Table 2 illustrates the results of legalizing immediately Dream Act-eligible individuals in the workplace. As with our demographic findings, we divide the results into two scenarios, the first (Scenario 1) for those who meet only the age at time of entry and length of residency criteria of the Dream Act and the second (Scenario 2) for those who meet the age at time of entry, length of residency, and educational criteria. Under Scenario 1, the immediate impact of legalization in the short run, as workers move to conditional legal status, would be an increase of $12.1 billion in U.S. GDP annually. Once the stock of capital adjusted in the long run, the annual gains would nearly double in size, to $22.7 billion. Under Scenario 2, in which the pool of eligible Dreamers is smaller, the immediate impact of legalization in the short run would be $7.6 billion annually, rising to $13.6 billion in the long run. In terms of individual industries, the Dream Act would bring the largest economic gains to wholesale and retail trade, leisure and hospitality, construction, manufacturing, and educational and health services. On a per capita level, under Scenario 2, the long-run economic gains for GDP would be nearly $12,000 annually for each individual who is legalized and $40,000 annually for individuals with conditional status who obtain at least some college education. And importantly, when GDP increases, prosperity increases as well. In the long run, after passage of the Dream Act, U.S. GDP would be 0.15 percent higher, and 0.5 percent higher with the education bump. Translating this out on a per capita basis, this means that the incomes of the average American would rise between about $82 and $273, annually.20 While small, these are important, positive increases in the economic well-being of the population. Over 10 years, as employers gradually carry out additional capital investments, the gains from legalization would continue to grow. As Table 3 illustrates, the cumulative gains from legalization between 2018 and 2027 would amount to $281 billion. Even so, these gains could be even greater as individuals complete the full requirements of the Dream Act to achieve LPR status. If even half of immediately eligible workers successfully complete the requirements for the educational path to permanent status—the “education bump” in Table 3—by obtaining either an associate degree or at least two years of college toward a bachelor’s degree, the 10-year cumulative gains from the Dream Act could be as high as $728.4 billion. What would happen if the entire Dream Act-eligible population, including those who could become eligible in the future, were legalized? According to MPI estimates, the number of eligible individuals could be as many as 3.245 million,22* which, as a group, is 42 percent larger than the 1.9 million employed individuals we have focused on in this study. Thus, our estimates are likely to underestimate the full economic gains from passing the Dream Act. 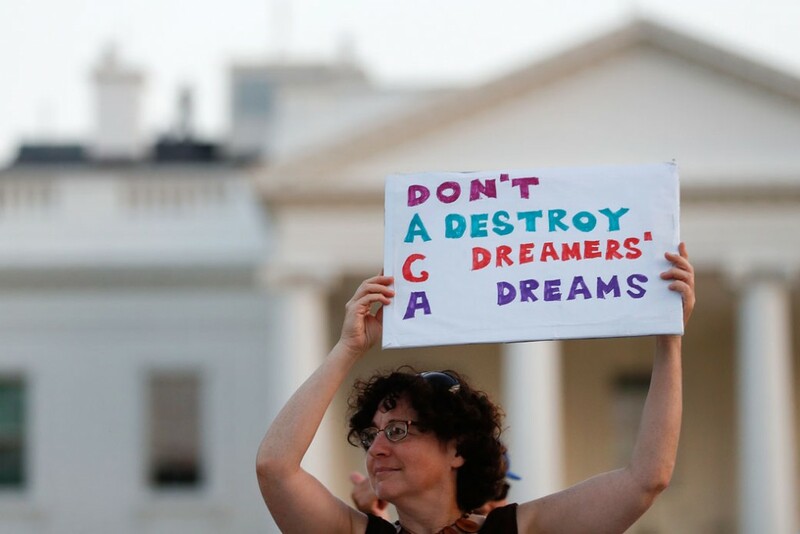 Roughly speaking, if the additional 1.4 million potential Dreamers obtained legal status and entered the workforce alongside and in a similar distribution across industries as the 1.9 million immediately eligible Dreamers, then the gains from the Dream Act could reach as much as 42 percent higher, for a total of nearly $400 billion in GDP over a decade. With the education bump, these gains could rise to as much as $1 trillion. 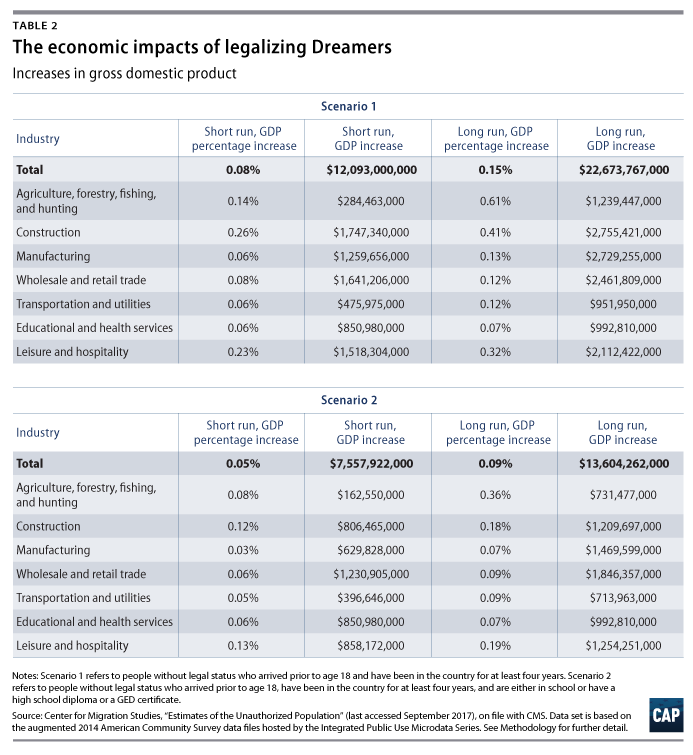 While these figures represent upper bounds of the economic impacts from the Dream Act—particularly because the 1.4 million potential Dream Act-eligible individuals look different than their immediately eligible counterparts because, for example, they are too young or not currently in the workforce—they illustrate how much the United States as a whole stands to gain by providing a path to permanent legal status for a substantial share of unauthorized young people who first entered the country as children. 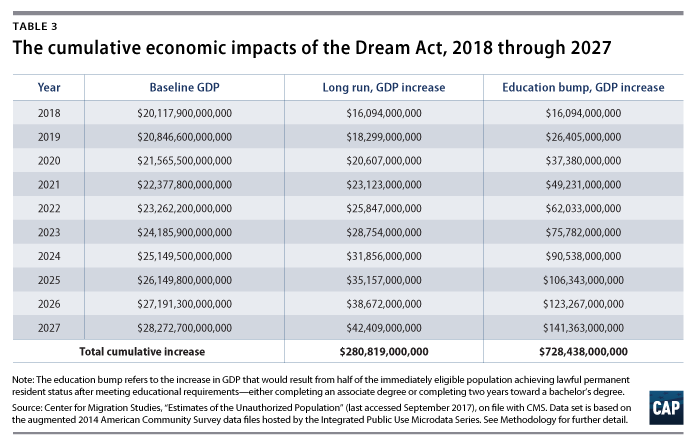 The results of this study illustrate the substantial and unequivocal gains for the entire U.S. economy from passing the Dream Act. In addition, as the two scenarios that comprise this analysis show, the less onerous the path to legalization of young unauthorized immigrants, the more people who would be potentially eligible and, ultimately, the bigger the economic benefits for the United States. As Congress debates the merits of the Dream Act, these numbers should be at the forefront of their deliberations. Francesc Ortega is the Dina Axelrad Perry associate professor in economics at Queens College CUNY. Ryan Edwards is the curriculum coordinator in the data science education program and a research associate in the Berkeley Population Center at the University of California, Berkeley. Philip E. Wolgin is managing director for immigration policy at the Center for American Progress. The authors thank the Center for Migration Studies for providing the census data utilized in this study. *Correction, December 8, 2017: This issue brief has been updated to correct a rounding error. The different types of labor are combined using a multinest CES aggregator. Capital and labor are then combined in a Cobb-Douglas fashion to produce output in each industry, with each industry’s labor share calibrated to match the aggregate labor shares observed in the data. We then conduct simulations of the effects of legalization on the level of production in each (1-digit) industry. We do so by comparing industry output as currently observed in the data with output in a legalization counterfactual.27 In addition, we also perform the analysis on a dataset that pools all industries together. This study distinguishes between short- and long-run effects, where the latter scenario takes into account the adjustment to the capital stock following changes in the workforce and additional investments in education undertaken by unauthorized workers in order to obtain lawful permanent residence. Relative to the existing literature, this study’s analysis is novel in several dimensions. First, we focus on the effects on the level of production at the industry level. Second, the analysis is based on a fully specified economic model that we calibrate using a combination of aggregate and individual level data. This model accounts for the degree of complementarities in production between different types of workers. In addition, we show that the model can be calibrated to incorporate the large heterogeneity among the unauthorized workforce in terms of skills and productivity. It is helpful to conceptualize legalization and its effects on the economy as a three-stage process. At first, legalization entails switching the legal status of eligible individuals as they acquire conditional status. Specifically, we leave their education, potential experience, and industry of employment unchanged and simply switch them from unauthorized foreign-born to authorized foreign-born. From the perspective of the labor market, conditional status allows unauthorized foreign-born workers to operate under the same conditions as authorized foreign-born immigrants. In our framework, this can be simulated by assuming that unauthorized foreign-born workers become indistinguishable from authorized foreign-born workers possessing the same education and potential experience. This amounts to experiencing a productivity boost now that they are not constrained by the limitations of undocumented status in the labor market. For example, they can now obtain a driver’s license and apply to a wider range of jobs. This study assumes that this process occurs within the industry in which we observe the worker; we do not model interindustry mobility. Individuals who may have DACA are included within unauthorized subpopulations in the ACS data, as estimated by CMS. The data will show any narrowing of the wage gap between authorized and unauthorized workers with the same education and experience that we expect to be associated with DACA. Thus, DACA status may be reducing the net productivity increase associated with legalization through the Dream Act in our simulation. If no individuals in the workforce had received DACA permits, legalization through the Dream Act would likely produce larger net increases in productivity and wages because it would bring about a more radical improvement in their labor market status than the data show. Because unauthorized workers are now endowed with the higher productivity of authorized foreign-born workers, legalization entails an increase in the overall amount of labor in the economy. As a result, this study’s theoretical model implies that in the short-run, there will be a shortage of capital that will push up the marginal product of labor. Over time, employers will invest more in physical capital—tools, machinery, and more—to regain the desired capital-labor ratio, which will provide an additional boost to production. As discussed earlier, this process of capital adjustment effectively renders the aggregate production function linear in labor. In most studies, this adjustment is assumed to take place within a few years. Here, we assume adjustment is completed by 10 years. Progressing from conditional status to permanent residence implies additional educational requirements for a portion of the Dream Act population. For the purposes of this study, we assume that half of all those who complete the pathway to LPR status do so by meeting the educational requirements. These additional educational investments further boost the economic gains from legalization. To assess the potential size of this effect, we conduct a simulation of the long-run effects of legalization, assuming that high school graduates on conditional status that did not have at least some college—an associate degree or two years toward a bachelor’s degree—now obtain it, but we keep their potential experience and industry of employment unchanged. We make no changes to the educational status of individuals on conditional status that already had an associate or higher degree. Relative to baseline, there now is an increase in skilled labor input. This increase has two sources: the larger number of people with higher education, due to the education bump, and the enhanced productivity because of the switch to authorized status.